Mirko Daneluzzo unveiled his proposal for a music center to be located on the waterfront in Toronto, an evident part of the city’s skyline, representing the vibrant on growing music scene. The project uses the preexisting Canada Malting Silos industrial building to convert it into the contemporary form of a cultural contamination beacon. The project is defined by a series of layers that have different performative qualities embedded that modify the character of the building as a person flows seamlessly through the space and experiences the curated environment of the building. The layer system generates a collection of musical experiences, from the strong typology of the theaters characterized by a clean geometry, to the eroded geometry that conforms the spaces in-between, research and education institutions, and knits the project to the surrounding context. The place gives you something to build the script to design something unique: Toronto is characterized by severe winters and hot summers, then the external layer works as a protective skin in winter thanks the slow formation of an artificial ice barrier in between the fissures, and wind catchers to allows a natural ventilation in summer. The eroded geometry is dealing with the aesthetic idea of “matte”: matte is the finishing of dull and flat, without a shine surfaces. Matte stores the time’s patina, it absorbs the context, it becomes the context. A AUS$25 million project, the Institute, located in the north of Queensland, Australia, will be a research hub, housing specialists in the social sciences, humanities, law and business sectors to examine the issues of importance to people in the tropics. 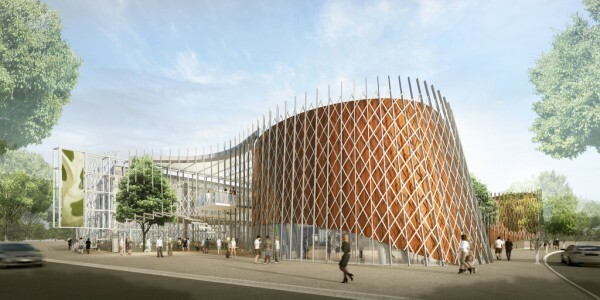 Putting The Cairns Institute and JCU on the international stage to attract post-graduate students from around the globe; and to enable the university to draw a high calibre of researchers was key to the winning design. “Attracting the best researchers was the central aim of the university – it was crucial that our proposed building design would create an environment that optimises the working experience to a point that people would love engaging with the building,” Mark Damant, Principal, Woods Bagot said. Panit Limpiti, a student from Thailand, has designed the “Permaculture Floating Tower,” a skyscraper to be located in Omval, Amsterdam that will cater to the region’s worst-case-scenario situation: a flood. The area above sea level in the Omval zone is quickly decreasing. 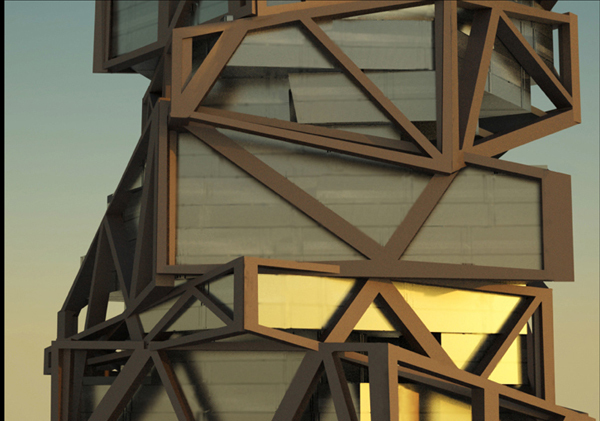 With the ability to withstand high water levels, and through the design of a floating landscape, this building will stand strong, no matter the weather forecast. Rugel Chiriboga, Brad J. Bartholomew, and Allison Elsaesser from Little have proposed a sustainable skyscraper complex for one of the world’s most dense urban landscapes: Mumbai, India. With its large population and the richness of the wetlands that surround the city, what Mumbai’s new construction needs to focus on, say the designers, is sustainable practices that can protect the environment surrounding the city, but also nurture the people who live there. A new complex needs to also be fully connected to its surrounding urban fabric, says the group. 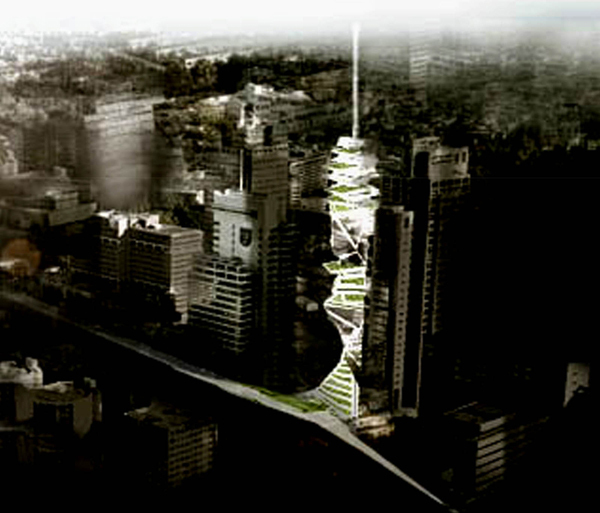 Lee Sang-ho, graduate student from Busan, South Korea, has designed the “Vertical Sprial,” a skyscraper that will serve as the “green energy landmark tower” for the city of Busan. Busan is the second largest in Korea, and is the largest port city. It is also considered to have the second-largest solar radiation levels in the country, and the highest wind levels, making the building perfectly situated to utilize solar and wind technologies to generate energy. The building will generate energy through several means, including the rotation of solar energy panels that will move throughout the day to capture the maximum sunlight in the day. The “Slum Dweller,” a skyscraper designed by architects Monica Copaja and Angel Tenorio , is a project that seeks to “bring light” to the city of Lima. The city has, in recent years, been rapidly expanding, the architects say, growing in a disorganized manner, with density creating a “desperate” need amongst the people for private ownership of land. What the architects propose is to build an inspiring tower of many important uses in the San Cristobal Hill area, one that has long inspired awe: the Hill was a sacred ritual site for the native pre-Columbian people of Lima, and has remained a favorite spot in the city thanks to its impressive skyline vistas. Three Copenhagen architects and a graduate student in Los Angeles have collaborated to create a new landmark for the Harbor of Copenhagen. 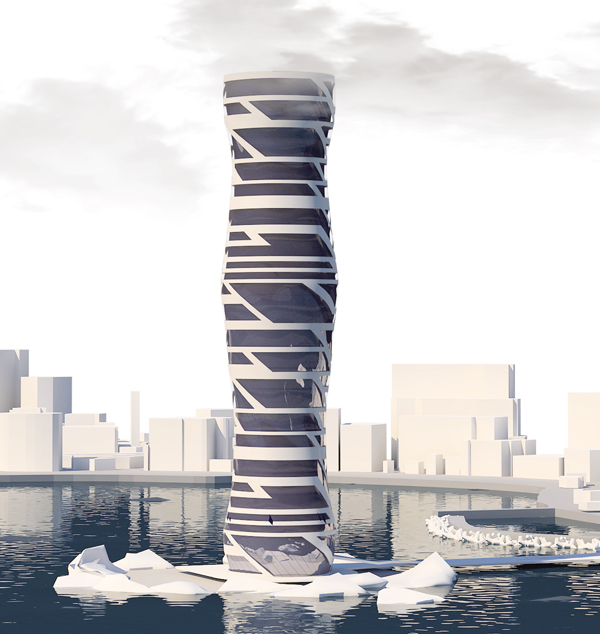 A skyscraper that houses a mixture of uses, including, “public, private, pauses, passages and parks,” this tower, conceived by Mathias Juel Christensen, Neel Gøbel Andersen, Søren Hansen, and student Bjørk B. Christensen, serves as a lighthouse, a beacon that welcomes ships to the great city of Copenhagen, and simultaneously harkens to the harbor area’s rebirth from abandoned shipyards to thriving residential district. 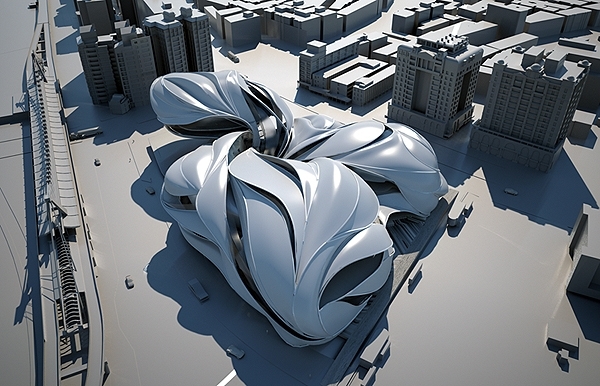 The B+U proposal for the Taipei Performing Arts Center began with a study of sound waves. 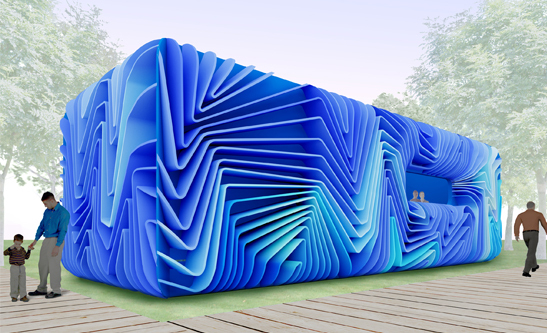 Sound was analyzed and transformed into a three dimensional form which informed the overall shape of the building. Inside are housed three performance areas. Radiating from a central foyer the Grand Theater and Playhouse form the bulk of the program to the north. Suspended above the plaza to the south is a multi function theater. 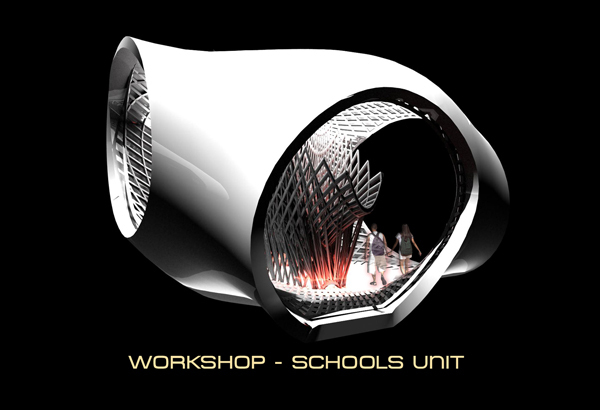 The uplifted section shelters the approach to the entrance, a multi layered foyer which connects to all three performance spaces. 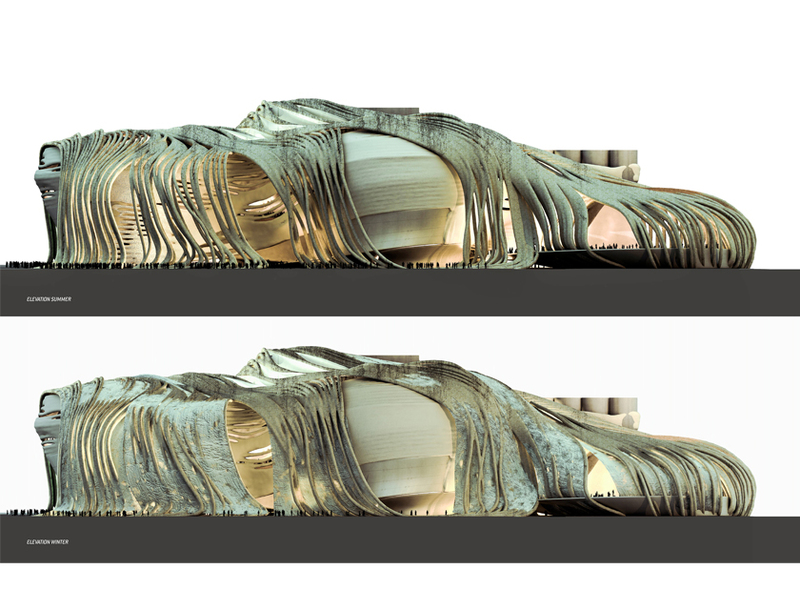 The parametric foyer is also a public gathering space that supports retail and assembly. Its massive staircase, glass walls and undulating form becomes the centerpiece of the building. 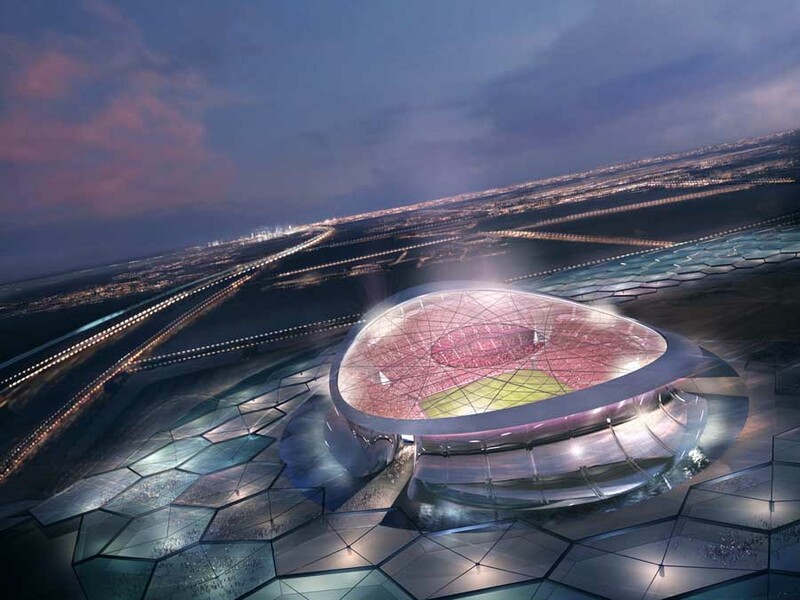 Foster and Partners unveiled their design for Qatar’s 2022 World Cup bid, the Lusail Iconic Stadium which will provide a world-class football facility for 86,250 spectators during the opening ceremony, group games and final. Reflecting Doha’s culture and heritage, the stadium is designed to be highly energy efficient and capable of performing in extreme summer climatic conditions. The stadium has a near-circular footprint and sits on the masterplan’s primary axis, which divides the stadium precinct into two halves. Encircled by a reflective pool of water, spectators cross the ‘moat’ to enter the building via six bridges. An outer pedestrian concourse extends from the water towards an array of smaller amenity buildings and a hotel at the stadium’s perimeter.